Bills undrafted rookie Jeff Tuel, as expected, will start at quarterback for Buffalo today against the undefeated Kansas City Chiefs. With Thad Lewis unable to practice at all this week due to sore ribs, Tuel will make his first NFL start. Here are the other Bills inactives for today’s game. With Thad Lewis also inactive it means that Matt Flynn will serve as the backup quarterback today. Buffalo’s quarterback situation is again in flux this week with Thad Lewis nursing some sore ribs. It could mean that the Bills have to start Jeff Tuel or Matt Flynn on Sunday. Despite the frequent changes at quarterback Stevie Johnson isn’t focused on who might be throwing to him this weekend. Whether it’s viewed as a competition to be the starter this week should Thad Lewis be unable to play due to sore ribs, Matt Flynn isn’t worried about how he looks in practice in comparison to Jeff Tuel. His only concern is knowing the game plan backwards and forwards. Flynn has three starts in his NFL career. Bills head coach Doug Marrone said late this week that his backup QB would be decided right before game time. That decision has been made. Jeff Tuel will serve as the b kip to starter Thad Lewis against the Dolphins today. Matt Flynn is inactive as he’s probably too new to the Bills play book to make the offensive staff comfortable that he could step in and execute the game plan. With Lewis coming off a sprained foot it may only take one good shot to re-aggravate it. Bills new quarterback Matt Flynn chose his college number after he was traded to Oakland this past offseason, but that wasn’t available here in Buffalo because 15 is worn by Chris Hogan. His number in Green Bay (10) was also taken (Robert Woods). So Flynn went in another direction. Flynn will wear jersey number 17. He was partial to 12 as a third choice, but quickly realized that wasn’t available in Buffalo. No doubt aware that the Bills were bringing in Matt Flynn for a workout Monday morning, rookie QB Jeff Tuel took it upon himself to go talk with head coach Doug Marrone to find out if his status on the Bills quarterback depth chart was in for a change. 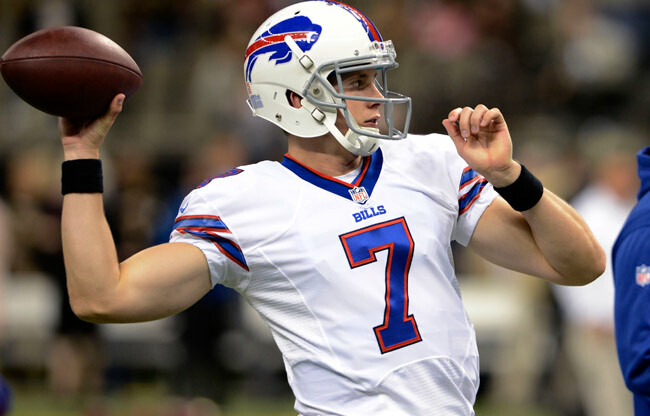 “There’s a chance there will be (more snaps for me) and I’m ready for it and I’m prepared for whatever the coaches need me to do,” Tuel told Buffalobills.com. As we covered on Buffalobills.com, if the newly signed Flynn can demonstrate a sufficient ability to run the team’s game plan this week, he’ll likely be tabbed as the backup, otherwise it will be Tuel this week as the number two QB. Can Flynn nail down game plan in a week? Bills new QB Matt Flynn has a chance to be the backup quarterback to Thad Lewis Sunday in Miami if he can demonstrate a firm grasp of the offensive system to the point where he can capably execute this week’s game plan. Flynn wanted to get a better look at the scheme before deciding whether it’s something he could pull off in a week’s time. Flynn believes there is some carry over from the West Coast systems he used to play in with Green Bay and Seattle to Buffalo’s scheme, though with it being an up tempo scheme he thinks the language will be more concise with Buffalo’s system. There were widespread reports that free agent QB Matt Flynn was in Buffalo today to work out for the Bills. Now with Thad Lewis sustaining a sprained foot, there are reports that the club is likely to sign the free agent QB. That according to CBS Sports’ Jason LaCanfora. For the second straight game the Bills suffered an injury at the quarterback position as Thad Lewis has a sprained foot. Reports of free agent QB Matt Flynn’s presence in Buffalo is fueling speculation that the Bills are looking for more alternatives at the position. A Minnesota Wild hockey beat writer reported that he spotted Flynn on his plane to Buffalo Sunday. Here at the Buffalo airport where Matt Flynn also just landed. Interview with the Bills? The Bills saw QB Thad Lewis finish Sunday’s game despite a foot injury that by Lewis’ description did not improve as the game wore on. Lewis said x-rays were negative and that it’s just a sprain, but his foot was in an immobilizer boot as he left Ralph Wilson Stadium. Alright Bills fans, second half of the schedule is up and there are two difficult road games on tap. Let’s hope for the best and get to your latest round of questions from AskChris@bills.nfl.net and @ChrisBrownBills on Twitter. Do you think Chan will ever not only start CJ, but give him the majority of the carries? I love Fred but he is not the game breaker CJ is and I think if he was on a lot of other teams CJ is a 1800 to 2000 yard man an 12-15 touchdowns. I admire Chan’s loyalty but question its productivity? CJ is a game changing threat every time he touches the ball and keeping him on the bench half the time no longer makes a lot of sense. What do you think? Please let me know what you think, and what Chan might be thinking, if he is at all? Thanks! CB: While I certainly believe C.J. is a game-changing back I think we all need to be fair to Fred Jackson and respect the fact that his knee was not right or close to 100 percent until Week 7 against Tennessee. We all saw the old Fred Jackson in that game, which was in stark contrast to what we saw the previous three games in his return from the LCL knee injury. If anyone deserves the benefit of the doubt it’s Jackson. In case you forgot he was lighting the league on fire with numbers similar to what C.J. is doing thus far this season. Right now they’ve got a good balance developed between them. Fred averages 14 touches a game to Spiller’s 13. They combined for over 220 yards of offense against Tennessee, which was the first time that both of them were truly healthy. I think Spiller can take it the distance on any play and I don’t mind seeing him get more of the work, but Fred’s talents cannot be ignored. Not to mention the fact that in this day in age in the league you do need two backs to get through a season. Week 1 when Fred went down in the first half and Week 3 when Spiller went down in the first half were reminders of that. CB: I think the Flynn contract could prompt them to move him, but the Seahawks need to find a trade partner that believes he’s a starter. His base salary does not fit for a backup because it goes up to $5.25M and then $6.25M. Unless he’s willing to take a pay cut to go elsewhere Seattle might be stuck with him. And furthermore I don’t see the Bills being interested even if he were available. As Buddy Nix told us he wants a long term franchise quarterback for the future. CB: We at Buffalobills.com wondered the same thing so we took a look at that play on tape and as the ball bounces near the sideline prior to Stephon Gilmore trying to bat it back in bounds, the nose of the ball is right on the line. It’s difficult to determine whether the nose of the ball is making contact with the sideline, but it’s extremely close. Knowing that’s before Gilmore even tries to make a play on the ball it’s easier to forgive the absence of a challenge there. Gailey did address this play and said they were not given a good enough replay angle to see if the challenge was worth it. At that point in time preserving your timeouts in the game were becoming critical. Granted if a chance to get the ball back is in play you probably challenge it, but without conclusive video evidence you can understand them not throwing the red flag. Furthermore the officials would’ve been looking at the same replay angle and likely would have let the play stand as a fumble out of bounds due to lack of conclusive evidence. I saw Chris Kelsay’s press conference regarding lack of effort, and having accountability. Watching the game, it appeared to me that the Bills’ defensive line was fine, and did have a push in the pocket. However, where I noticed a lack of effort was in the linebacking corp, and some in the defensive backfield. Now, I am a native Buffalonian, and have been in Central Florida for just over five years, and I am still a die hard Bills fan. In my opinion, the players are either not buying into the scheme, or the players themselves, be it veterans or rookies, are not holding each other accountable. Coaches are important, but they can preach all day long, the players have to perform. The offense is fine, when Fitzpatrick does not throw bone head interceptions. I am just venting. I want the Bills to do well in the worst way. What is your analysis? CB: I don’t think there’s any question that the defensive has underachieved. Head coach Chan Gailey did say that Mario Williams and Marcell Dareus both have to do better in particular. The linebackers in the Titans game did mess up some gap assignments, including the one that Chris Johnson took 83 to the end zone. Here’s the good news, Kelsay in that same press conference said players that were not pulling their weight were going to be shaken down and held accountable. And in our 1-on-1 interview with Coach Gailey that will air tomorrow on Buffalobills.com, he told me his players have found a newfound respect for playing for the guy next to them. Let’s hope it makes a difference on the field. CB: When Coach Gailey was asked about possible lineup changes and about Morrison specifically, he said that Morrison is probably going to be needed in the lineup before the season is over. However, it sounded like he was indicating that somebody in the linebacking corps over a 16-game season is likely to go down and at that point they’d plug in Morrison. So I don’t see the veteran taking somebody’s job right now.